Gone are the years of the traditional pensions and 30+ years with one company. Today, people need to be much more reliant on their own means of saving, investing, and planning. It’s definitely a hard task when there is so much data out there, so many “wants” eating at your ability to save, and most importantly the know how on where to start. Regardless, with the Great Recession burned into our near term memory I think most would agree that NOW is the time to be more aggressive with taking our retirement plans into our own hands. Point blank…you need to start and start now! Behind every good pension is a large sum of cash that will help protect your investments and secure your financial future. A good start point would be at least $25,000, but preferably closer to $100,000. Sounds easy doesn’t it! Ha! Tip: try and contribute the lowest amount to your 401(k) or 403(b) to get your company match and save the rest in cash. This will help you take advantage of your company’s “free money” and build up your cash hoard. 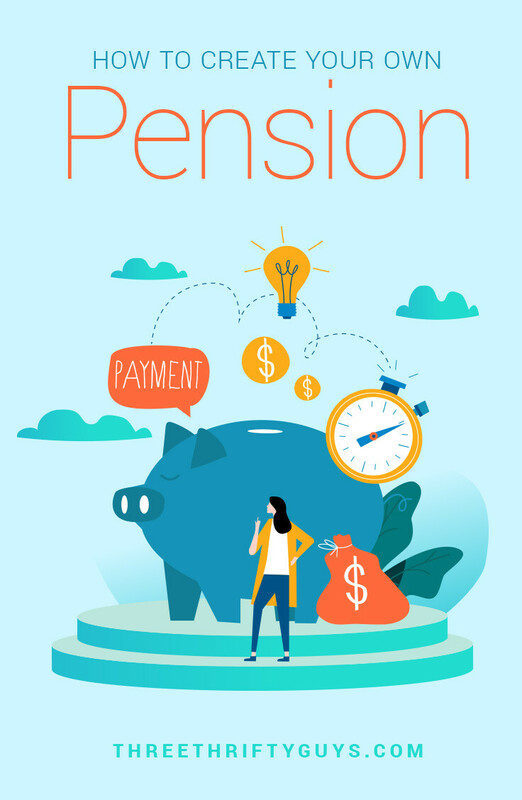 Every great pension fund firm has their client’s pensions spread across hundreds, if not thousands, of investments to diversify their investments. Your “self-pension” should be no different. (fyi: You’d be setting up your pension with great risk if you were to only invest in a handful of investments.) First off, know what percentage ratios of stocks, bonds, and cash you want your traditional investments to look like. Your traditional retirement products could be a total of 75% of your total pension portfolio. Look at other alternatives, like tax liens, being a landlord, gold or silver, or mutual funds (dynamic mutual funds or managed payout funds), to round out the other 25%. For the portion of your stock holdings it’s important to focus on companies with good balance sheets, low debt, and most importantly provide a good dividend. These quarterly dividends will help paying yourself every three months, and lighten the burden on your bond and cash investments. Tip: prior to retirement invest 100% of your dividend stocks back into purchasing more stock, and post retirement only take out the dividends. Never touch the principal investment. Like I’ve written about before, a good retirement plans switches the mindset of dumping X percent into a 401(k) and changes your savings into “multiple streams of income.” By creating your self-pension, its a good opportunity to leverage these residual income streams into your overall retirement picture. FYI: The big push here is to move away from solely relying on your employer retirement plan, and relying more on your self directed investments (post tax). Annuities are in themselves a self contained pension. The problem is most annuities require a large initial sum of money ($100,000+) and won’t allow for further investments. Once you get to retirement look at purchasing an annuity to help stabilize your overall investment portfolio. This idea will further help diversify your pension investments and ensure the long term livability of your monies. For a lot of people a big hurdle in moving into retirement is knowing how much you’ll need to last to the end of your life. From each investment you should have specific dollar amounts you need to generate from them every month (post retirement). Write these values down in order to have an objective to get to. This way you’ll know if you are on track with each income stream. With a typical company pensions they offer pension estimate calculators. These calculators help you determine how much you’ll get at estimated retirement dates (what-if scenarios). Since you’re directing your own pension, then the responsibility is on you! Since I’m such a graphical guy I usually need to see what this self-pension looks like. Above is a example of how you can conceptually look at this different retirement perspective. I’d be interested to here how some of our readers have created or are creating their own pension? How are you using annuities in your overall portfolio? What do you do to help stay on track? This is a great post.Thanks for sharing this post. This is a great post, I love it. Multiple income streams is so important for our savings. As a financial planner I always tell my clients that diversifying their portfolios is so important for their retirement planning. I am going to share this post next Friday on our weekly roundup at Dinks Finance. Have a great weekend guys! I really haven’t thought about creating my own pension. Maybe because I’m too busy with my present situation that I tend to forget the future; or maybe because I feel that I’m still too young to think about such things. By the way, thank you for giving me these wonderful ideas on how I can start saving. I do agree that we should be more insistent in making our own retirement plans. No matter how young we are, it is better to start early. Why not max out an employer sponsored retirement plan *and* build up a cash hoard? Good post! I agree that the events of the last few years should make us more mindful about how we need to prepare for retirement. Many companies have shifted this responsibility to the employee which means we need to be proactive and not sitting idly by. With this in mind, it’s vital to start preparing those multiple avenues to create income and wealth.